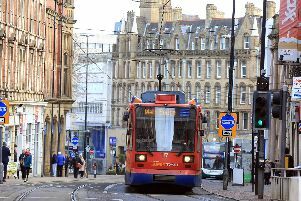 Sheffield is among a list of cities across the UK invited to bid for a share of an £840 million transport improvement fund, the Prime Minister has announced. Theresa May said the funding would help "spread growth beyond London and empower local businesses to create more, better-paying jobs". The Government say the extra cash could go towards new bus routes and major employment hubs, smart technology aimed at reducing congestion, or rolling out docking stations for e-bikes. Mrs May said: "Our great cities and their suburbs are home to millions of people and world-beating businesses. We want to help them succeed, so as part of our modern industrial strategy we will fund £840 million of upgrades for better, safer, faster transport links. Transport Secretary Chris Grayling added: "Good bus, cycle and tram routes play a huge role in increasing the vitality and vibrancy of cities. These 10 areas now have the chance to transform their transport systems - making it easier for people to get around and enhance links to work, school or shops." The ten shortlisted city regions will each receive an initial £50,000 as well as support from Government to co-develop the strongest cases for investment.